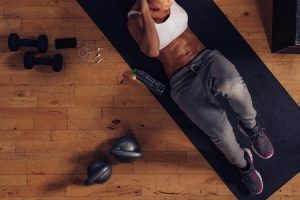 Setup your home gym with basic equipment and starting toning up today! If home is where the heart is and if you love to stay fit, then you should be able to work out in the comfort of your own home. Setting up a home gym is not as expensive as you think. You can get a great workout with portable equipment. Kettlebells are convenient because they are compact and can be stored easily. They are also more difficult to balance compared to dumbbells because of their solid, compact body and thicker handles. 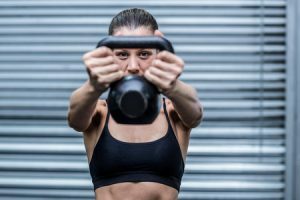 Kettlebells are great for strength and conditioning exercises. The Medicine Ball is a dynamic piece of equipment that can be used for strength and conditioning workouts, plyometrics and stability programs. It is convenient and portable enough to help you maximise space. You can do a whole body workout with Gymnastics Rings. Using Gymnastics Rings increases tension in the muscle and will improve overall stability, agility and mobility. You’ll just need a place to hang the rings. You can try the adjustable Pull Up bar. Resistance bands are a multi-purpose piece of gym equipment. You can use them for dynamic warm ups or add resistance to bodyweight and kettlebell exercises. These are very convenient to use and easy to store away. Start out with a pair of light resistance bands but have both medium and heavy resistance bands on stand-by. Swiss Ball is the ideal home gym equipment to make regular exercises such as pushups, sit ups and leg raises more challenging. These are light and easy to store away. Jump Rope is one of the best ways to warm up the body because it is a low-impact exercise. You can use jump rope to build cardiovascular endurance or develop coordination. The Pull Up is a classic, old school exercise that remains popular because of one reason: it works! The Pull Up can build strength, stability and mobility. You can also use the Pull Up Bar to hang your Gymnastics Rings. The Ab Wheel has been a stand-by in every commercial and home gym because it challenges your core like no other exercise. It is light, portable and easy to store away. The Foam Roller is the secret weapon used by many trainers to help prevent injuries and improve exercise performance. By simply rolling a body part over the Foam Roller before exercise, you activate muscle fibres and increase blood flow. You can use the Foam Roller for your warm up or warm down routines. The Exercise Mat may not seem much but it is valuable for providing cushion and comfort for all of your floor-based exercises. You can use the Exercise Mat for stretching, Yoga or Pilates. Total cost of all of the equipment is AU$515. You do not have to buy all the equipment at once. You can start out with the exercise mat, kettlebells, jump rope and foam roller and still get great workouts! *- You can add a resistance band below your knee to increase tension on the hips. *- You can place one knee on a resistance band to assist you when doing Pull Ups. Signing up for a gym membership is always a great investment for your health and fitness. But having a home gym ensures you never have to miss another workout!